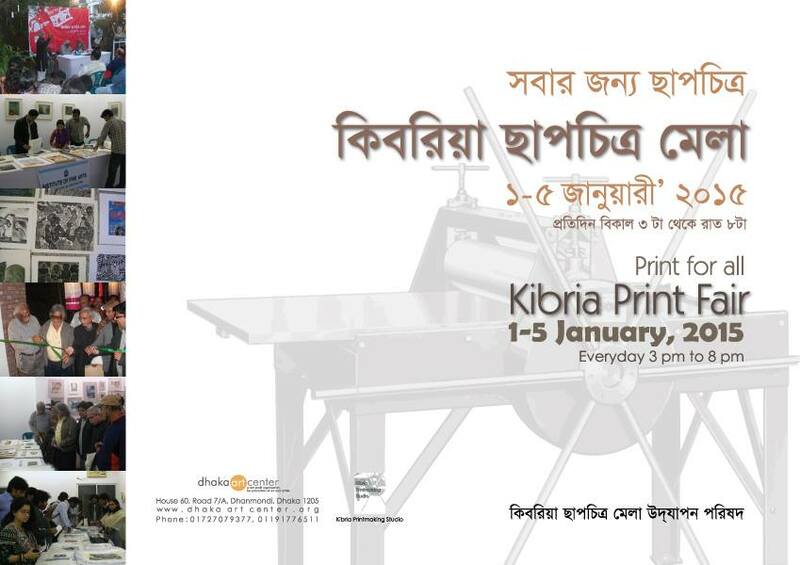 The 4th Kibria Print Fair has been arranged to commemorate the 6th founding anniversary of Dhaka Art Center, from 1-5 January, 2015. Fourteenth printmaking studios from around the country will participate in the fair with prints created by eminent and young printmakers of Bangladesh. At the opening ceremony of the fair ‘The Life Time Achievement Award’ will be presented to Eminent Artist and Printmaker Monirul Islam for his valuable creative contribution in this field, and for the first time three young printmakers will awarded ‘Young Printmakers ward 2015’ on this occasion. This national event will be inaugurated by Mr. Asaduzzaman Noor, MP, Honorable Minister, Ministry of Cultural Affairs, Peoples Republic of Bangladesh. Art Connoisseur Durjoy Rahman Joy will attend the program as special guest. The function will be presided over by Eminent Artist Rafiqun Nabi. Your participation will ensure the success of the Print Fair.